I love this little globe I picked up at a yard sale a few years ago. I have transformed it a couple of times over. It’s had two Halloween make-overs and been repainted for Valentine’s Day. I have another project coming up, but in the meantime, I got a wild hair and decided to do a quick ombre treatment. It’s pretty fun, right? I like that it’s kind of beachy and that I can just paint over it and make it something else. I started out by painting over the heart and text from the Valentine’s Day globe. I just used a basic spray primer and grabbed 4 graduated shades of blue acrylic paint. Fortunately, globes come with latitude lines. These make great guidelines for painting the stripes of color. I started in the middle (um, at the equator) and then worked my way out from there, blending the colors as I went along. Not. Rocket. Science. Easy, fun and best of all, can be painted over the very second I get bored with it. 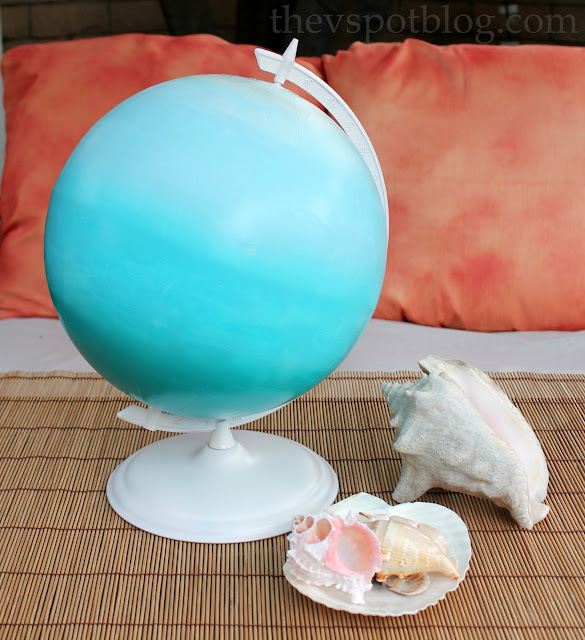 Do you have a globe…? Whatcha gonna do with it? 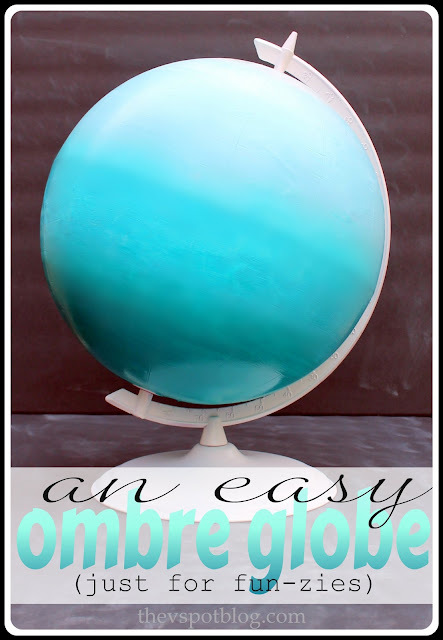 I love all these globes! I seriously need to go out and find a globe to craft with! I love this! It turned out so cute! What an innovative idea! I love the colors!